According to ancient texts there was a fourth pyramid located at Giza plateau and it was made of a dark or black granite-like stone. 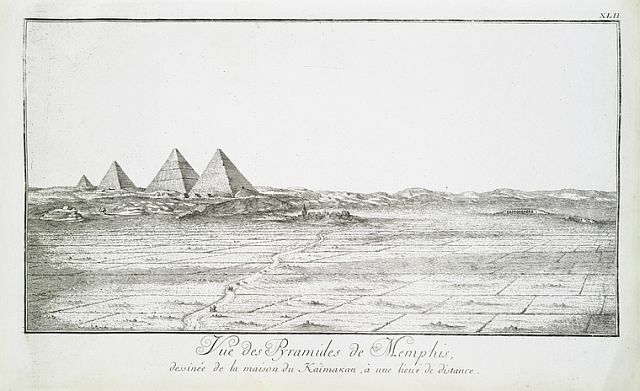 During the 1700’s, Frederic Norden, a Danish naval captain, and explorer, made extensive notes, drawings and maps of pyramids, ancient monuments and the architecture, etc. which was published in his book Voyage d’Egypte et de Nubie. "The principal pyramids are at the east, south-east of Gize. There are four of them; that deserve the greatest attention of the curious. For tho we see seven or eight others in the neighborhood, they are nothing in comparison to the former. The two most northerly pyramids are the greatest and have five hundred feet perpendicular height. The two others are much less, but have some particularities, which occasion their being examined and admired." "It is without coating, closed and resembles the others, but without any temple like the ﬁrst. It has however, one particular deserving remark; which is, that its summit is terminated by a single great stone, which seems to have served as a pedestal. The fourth pyramid has been made, upwards above the middle, of a stone more black than the common granite, and at least as hard. Its summit is of a yellowish stone." "I shall speak elsewhere of its top, which terminates in a cube. It is, moreover, situated out of the line of the others being more to the west…it makes a series with the three others." Although Norden’s descriptions are very detailed and the excellent illustrations show the position of the fourth black pyramid located at some distance from the three well known pyramids at Giza, Egyptologists suggest that Norden accidentally refers to a satellite’ pyramid of Menakure as a fourth pyramid. But the satellite pyramids are made of sandstone while Norden described in detail that the fourth pyramid was made of a stone harder than granite and very dark or black. It seems unlikely that he has referred to a satellite pyramid. 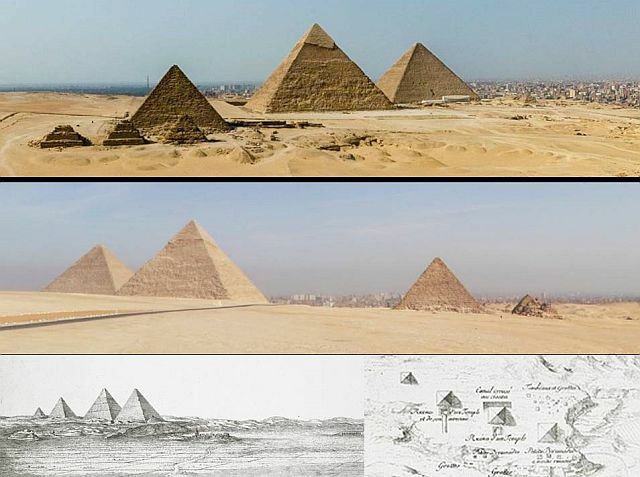 So, is it possible that the Giza plateau once featured a fourth pyramid made of black or very dark granite or as Col. Vyse already suggested in 1840 that Norden has described one of the Menkaure satellite pyramids as the fourth black pyramid at Giza. The smaller Menkaure pyramids are indeed darker than the other pyramids, but certainly not black. 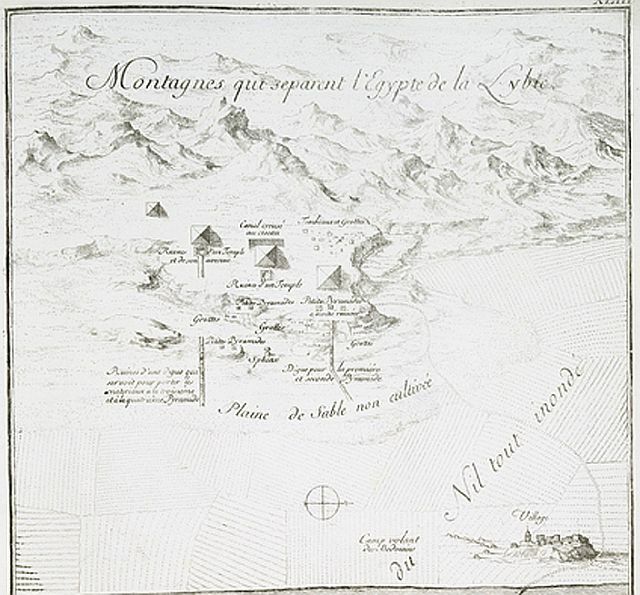 Aerial view of the Giza plateau including two of Norden's drawings. But something is not right. If we are looking at his drawings we see only four pyramids. Is it possible that Norden overlooked the satellite pyramids which are close to the other ones? Given the excellent descriptions and illustrations it seems unlikely that he missed the satellite pyramids, except if they have been (partially) buried in the sand. Furthermore, let's assume he's right about the existence of a fourth dark/black pyramid, then where are the remains of this pyramid?